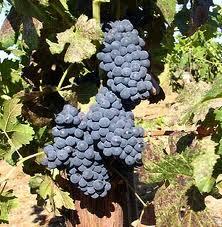 Petite Sirah (Durif) is a variety of red wine grape primarily grown in California, Australia, France, and Israel. Recently, wineries located in Washington’s Yakima River Valley, Maryland, Arizona, West Virginia, Chile, Mexico’s Baja Peninsula, and Ontario’s Niagara Peninsula have also produced wines from Durif grapes. It is the main grape known in the U.S. and Israel as Petite Sirah, with over 90% of the California plantings labeled “Petite Sirah” being Durif grapes; the U.S. Bureau of Alcohol, Tobacco, Firearms and Explosives (ATF) recognizes “Durif” and “Petite Sirah” as interchangeable synonyms referring to the same grape. It produces tannic wines with a spicy, plummy flavor. The grape originated as a cross of Syrah pollen germinating a Peloursin plant. On some occasions, Peloursin and Syrah vines may be called Petite Sirah, usually because the varieties are extremely difficult to distinguish in old age. Petit Sirah is produced in over 340 California wineries, including Ancient Peaks in Santa Margarita and Frangipani in Temecula.